MG-SOFT Trap Ringer Professional Edition is a program for monitoring SNMPv1, SNMPv2c and SNMPv3 TRAP notification messages and SNMPv2c and SNMPv3 INFORM notification messages sent by arbitrary devices on the network. It lets you manage received notifications in various ways and includes mechanisms for informing users about events reported by the received SNMP notifications. Trap Ringer lets you monitor received SNMP notifications in the main window by viewing the Console log (used for real-time monitoring) or any other log file created by this application (e.g., a daily log file or a log file containing filtered notifications). The software can send information about received SNMP notifications by e-mail to any number of recipients, as well as log it to the system log files (using the syslog protocol on Linux, Mac and Solaris). Trap Ringer can also invoke external programs or scripts upon receiving SNMP notifications in order to start any number of specific actions by providing command line parameters for each of them, as well as generate and periodically update any number of HTML report files that let you monitor SNMP notifications by using a Web browser. In addition, Trap Ringer can also act as an SNMP notification proxy forwarder application, meaning that it can forward received SNMP notifications to other SNMP management stations on the network and optionally translate notification messages to the selected SNMP version (SNMPv1, SNMPv2c, SNMPv3 USM or TSM) and type (Trap or Inform). These diverse features can all be used simultaneously. The software runs natively on MS Windows, Linux, Mac OS X and Solaris operating systems. Trap Ringer main window displays details of each received SNMP notification message. The left panel of the main window contains a list of received notification messages. Clicking a notification message in the list, displays all details about the message in the upper right panel. Clicking the enterprise line or a variable binding in the upper right panel, displays all attributes of the given OID as defined in the relevant MIB module. The software provides advanced filtering capabilities that let you configure filters for capturing or processing only those SNMP notifications that match the specified criteria. A filter can be configured either manually or by selecting a received SNMP notification and running a wizard, which produces a filter for receiving or blocking the same type of SNMP notifications in no time. Trap Ringer also lets you assign different severity level icons and colors to SNMP notifications to indicate their importance and provide a better overview of received notifications displayed in the main window. Trap Ringer displays all the details about received notification messages and included variable bindings by retrieving the relevant data from MIB modules that provide this information. 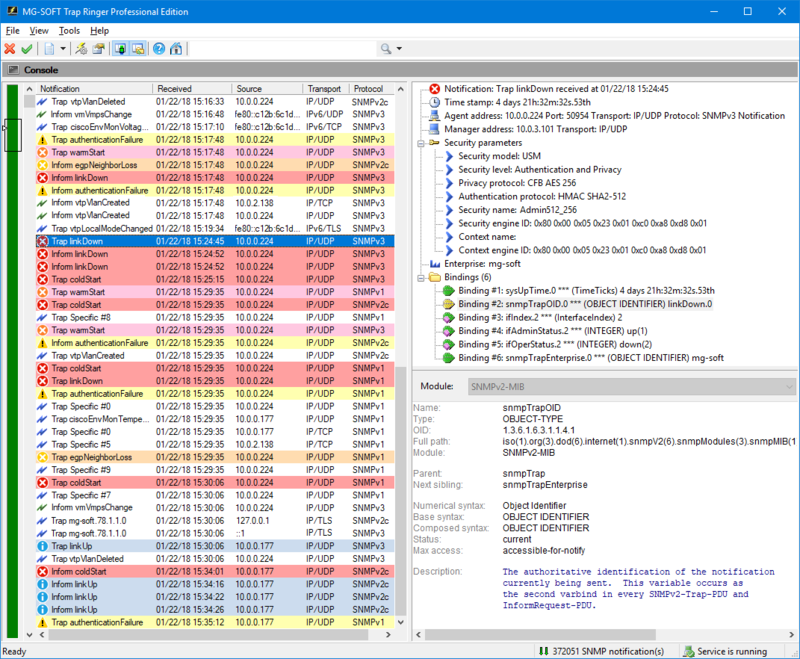 The enclosed MIB Compiler lets you compile any vendor specific MIB file for use with Trap Ringer in order to provide more valuable and meaningful information about received SNMP notifications to users. The information about received SNMP Trap and Inform notifications can also be exported from Trap Ringer to CSV (comma-separated value) ASCII files for the purpose of external viewing or post-processing. Trap Ringer supports IPv4 and IPv6 transport protocol and can receive SNMPv1, SNMPv2c and SNMPv3 USM notifications on any UDP and TCP port. Furthermore, besides the standard SNMPv3 User-based Security Model (USM), MG-SOFT Trap Ringer implements also the Transport Security Model (TSM) with support for SNMPv3 over (D)TLS (RFC 6353) and can be configured to receive SNMPv3 Trap and Inform notifications on any TLS/TCP and DTLS/UDP port (using X.509 authentication). Moreover, the software supports also HMAC-SHA-2 authentication protocols (RFC 7860) and AES-192, AES-256 and 3DES privacy protocols in SNMPv3 USM. Trap Ringer employs the client/server architecture in a sense that the notification receiving module (server) is separated from the application's GUI (client). The server module, which continuously runs as a service/daemon application, receives SNMP notifications from the network and processes them according to applied configuration. Trap Ringer client, which runs on the same computer as Trap Ringer server, is a regular GUI application that, when started, connects to the server and lets you view and manage received SNMP notifications, as well as control and configure both parts of the application. Trap Ringer features a modern and intuitive graphical user interface that fully supports today's high pixel density (HiDPI) displays (e.g. UHD/4K). MG-SOFT Trap Ringer Professional Edition is available for MS Windows operating systems (Windows 7, Windows Server 2008, Windows Server 2012, Windows 8.x, Windows 10, Windows Server 2016), for Linux operating systems running on Intel x86 and x86_64 architectures (Red Hat, SuSE, Ubuntu, Debian,...), for Apple Mac OS X (Intel x86_64 architecture), as well as for Sun Solaris (for Intel x86 and SPARC platforms). "Thanks for the Trap Ringer fix. A quick test shows that it does indeed work as expected. I will be performing additional testing and I'll report any difficulties, should I experience them. I appreciate the fast response on this issue as it impacted my ability to demo my SNMP agent. It's a pleasure doing business with MG-SOFT. Your response to my service requests has been excellent."